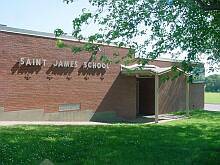 St. James School is accredited by the State of Indiana. The school is also an active member in the National Catholic Education Association (NCEA), and the Indiana Non-Public Education Association (INPEA). St. James School provides faith formation and holistic educational experience which enables students to become self-confident, contributing members of society.